Look at my sneaky little humble crumble! Why is it sneaky? 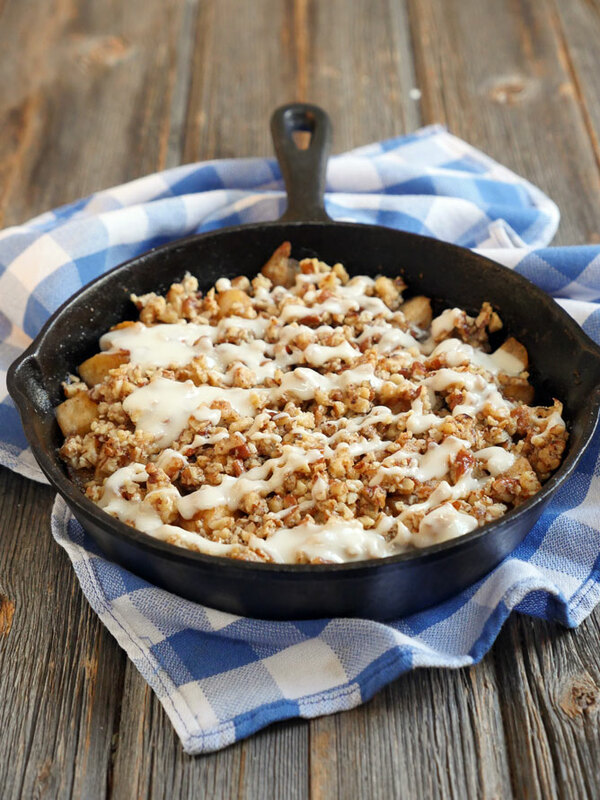 Because even though it looks like an ordinary apple crisp… it’s actually special. Like, very special. 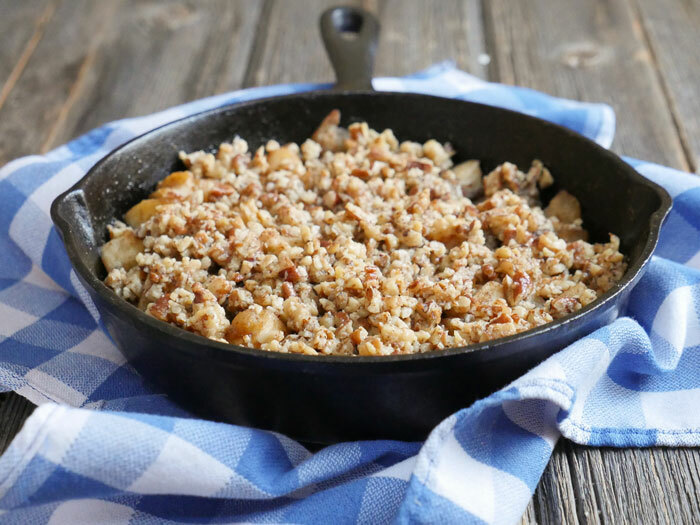 This apple crisp is special because it’s made with a unique blend of somewhat unexpected spices. I’m talking about garam masala. “Garam masala” translates to “warming spices” and that’s exactly what they are. So what’s in garam masala? Cardamom, cinnamon, cloves, cumin, black pepper and coriander. The last three don’t seem like “dessert spices” but that’s what makes the flavor of this dessert so unique! Don’t get me wrong – the spices aren’t overwhelming, they’re actually very subtle. But using them adds a fun twist to this classic dessert. I’ve used garam masala in a dessert before – remember my garam masala pumpkin pie? I made it twice last year, for Thanksgiving and for my husband’s birthday and it was so good! 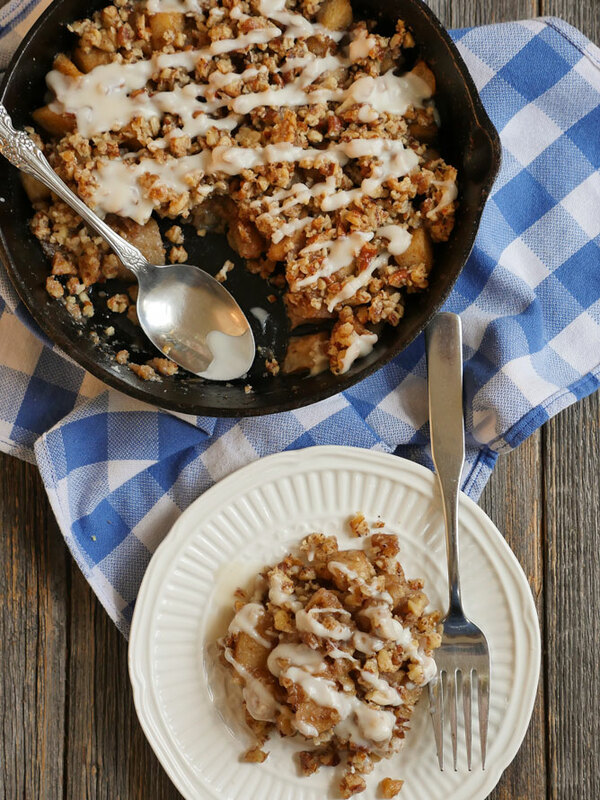 I like this apple crisp just as much. There’s something you should know about me… I am the queen of kitchen gadgets (read: kitchen gadget addict). Some of my gadgets are useful and some are not. BUT I have to tell you about my new very useful discovery: an apple corer. I seriously do not know what I did without it. How did I core apples? Like a fool… that’s how. I know, that’s dramatic but I feel like my apple corer is a game changer… I am so sure that I’ll be eating twice as many apples now. 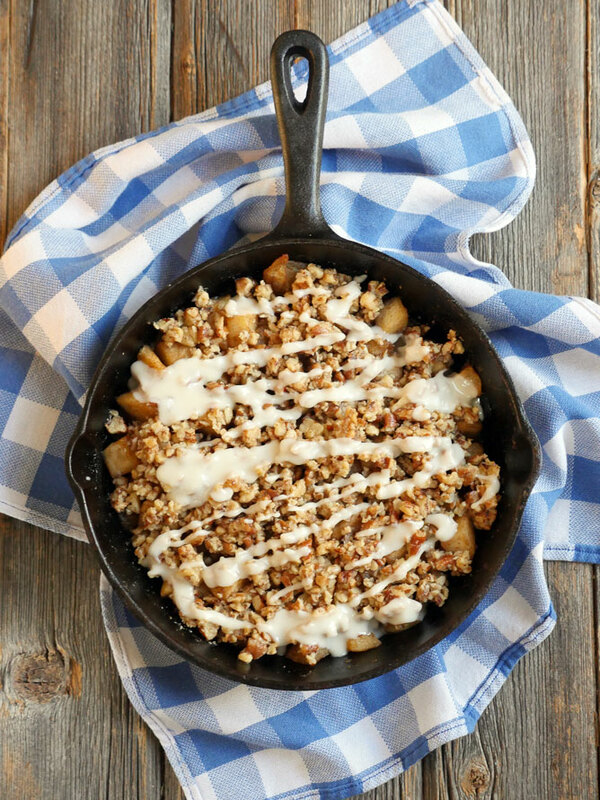 I love the combo of sweet spiced apples topped with crunchy chopped pecans and walnuts. To make this look a little fancier, you can even drizzle melted coconut butter on top! This is such an easy and simple dessert to make – it’s plenty for 2 and enough for 4 if you serve a little ice cream on the side. Melt coconut oil in a cast iron skillet over medium heat. Reduce the heat to medium-low, then add the apples and spices. Saute for 4-5 minutes, or until the apples slightly soften. 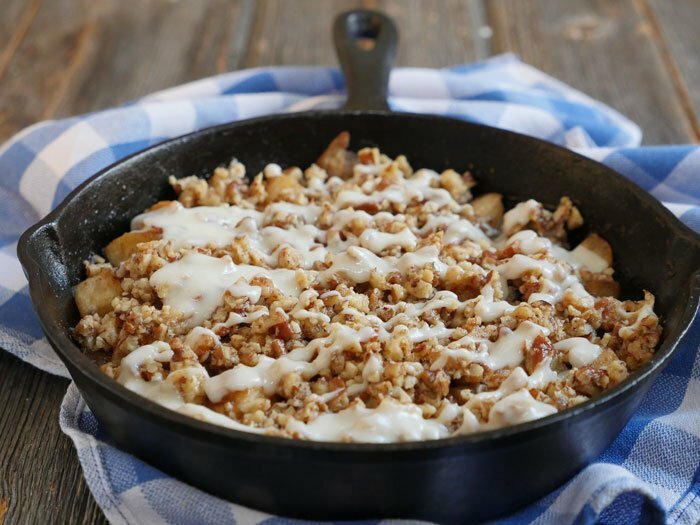 Combine the topping ingredients together in a bowl and then sprinkle the topping overtop the apples. Drizzle coconut butter on top if desired (and if the coconut butter is too thick to drizzle, add some coconut oil to it to make it thinner). What’s the best kind of apples to use? Do you peel them? Any sweet apple will be just fine! And I do peel them because I prefer it that way but it’s up to you! Thank you! Love your recipes, BTW. Your sarson ke saag is amazing! Hi Ashley! Thank you so much for this recipe! I made it, and it is beautiful! I love it love it love it! Can I double or triple the recipe and bake it in a baking dish? I want to make this for my husband’s holiday potluck. Hi Ashley! 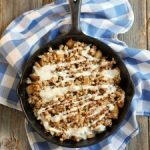 I know I already commented on this recipe in the past, but I just wanted to let you know how well this recipe pairs with chai as a snack! I made it when my family came over for tea time, and they loved it! Hi Maneesha! So happy to hear that 🙂 Thanks for sharing! !